Boulder. The high was 5 degrees the other day. The high! That is Fahrenheit. I am on the verge of losing my mind. How to keep softening, surrendering, and opening. You only have to know me for about eight milliseconds before you discover how much I dislike winter. I am so tired of feeling like life is against me. A battle which I appear to be losing. Of course, that is all in my mind. The tightness. The contempt. The contraction. Compassion is the balm for this ancient darkness. There are places where it doesn't yet penetrate. Muscles guarded by fear. Everything has to be welcomed. Nothing banished. All of it massaged by the soothing hands of Mother Prajnaparamita. And yet I can't help think that I would much rather face my inner demons and dragons in the silent solitude of some sunshiney locale - unfettered by the contracture of winter's icy meanness. My skin soaking up rays of warmth to melt my ego-clinging. 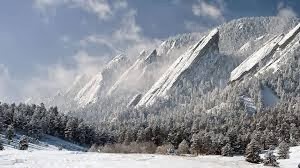 In 2004 I moved back to Boulder. How I could easily obsess about hating myself for returning to this town which refuses to let me go. Of course, one doesn't make the best decisions under the duress of suicidal depression. Still. Welcome the self hatred. Give it a warm bath. Spoon feed it something soft and sweet. Tuck it into bed with a lilting lullabye. Rub the back of her heart. In the end, it all comes back to "what about me?" the root of all suffering. Can't just keep plucking the shoots. Have to dig deep down into the cracks and crevices and find the tricky root. The root of the root. Clean it off. Roast it. Eat it. Holding on to the fantasy that at some point everything will come together and finally make sense. That the pain and torment will have some higher purpose. Let everything tenderize my being. Resist nothing. Surrender to the flow of all events. Create the causes for freedom. Dissolve into my heart. Less talking. Less thinking. Love and let go.